The NIOSH Mining Program’s mission is to eliminate mining fatalities, injuries, and illnesses through relevant research and impactful solutions. In our current research, we are working hard to reduce miner overexposure to hazardous dust and diesel contaminants, reduce miner overexposure to noise, remediate risk factors for musculoskeletal disorders, eliminate fatalities and injuries caused by mobile and stationary equipment, eliminate fatalities and injuries caused by rock falls and damaged ribs, and reduce the risk of mine disasters. We value relevance, impact, excellence, integrity, innovation, and collaboration as we join our stakeholders in fostering an industry of safe mines and healthy workers. The EVADE software has been expanded to take in more data points and identify more hazardous exposures. 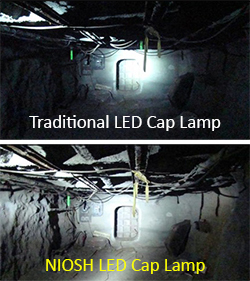 Years of successful illumination research by NIOSH scientists have led to advances in the functionality of cap lamps worn by mine workers.